"This is by far the finest and most comprehensive View that can be obtained of the South Front, including in its range the two Western Towers. The huge buttresses which are seen spanning over the North Cloister are magnificent. Indeed the whole of the South Aisle is most venerable in its appearance, and the tracery in the Cloisters majestic. This view was taken from the old wall, one of the most prominent remains of the Confessor's building, at the rear of the East Cloister." Westminster Abbey was founded by Edward the Confessor and was consecrated in AD1065. It was rebuilt in the 13th century in the French gothic style, with a nave of great height, flying buttresses and rose windows. 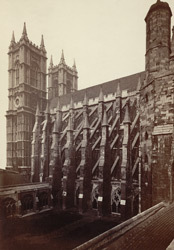 The monastery was dissolved by Henry VIII in 1540 and the abbey became the cathedral of the new diocese of Westminster.